Instantly create the ultimate environment for your outdoor living space or business today. You have just found the best outdoor misting fan on the market. "The Rock Fan" is a patented outdoor misting fan system developed for outdoor cooling on areas for theme park cooling, playground cooling, water park cooling, golf courses cooling, swimming pool decks, sunbathing areas, outdoor event cooling, resort cooling, water park cooling, municipal parks, zoo cooling, backyards and botanical gardens. 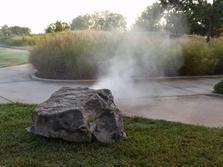 The Rock Fan is the ultimate, hidden outdoor misting fan system cooling station. The Rock Fan can also be retrofitted to any existing misting system giving you the ultimate misting fan. "The Rock Fan" product is aesthetically pleasing and virtually blends into any environment, giving it a natural look and not detracting from park amenities, rides, golf greens, etc. The Rock Fan has a built in high pressure misting system that delivers a flash evaporating fog approximately 40 feet, giving you the ultimate outdoor cooling. 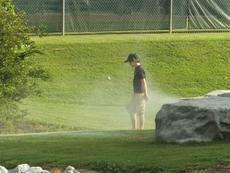 Our high pressure misting pumps allow you to add additional misting nozzles if needed. "The Rock Fan uses 110 power and uses very little water or electricity. We also represent other problem solving outdoor living products such as patio heaters, football sideline misting fans, misting fan rentals, misting systems, industrial fans, park equipment, playgrounds, custom faux rock, evaporative coolers and portable misting fans. Event setup, service and installations are available. Call us for details. For detailed system information and pricing, please contact Jay at jay@therockfan.com or you may call 800/844/8783 or 256/366/4375. 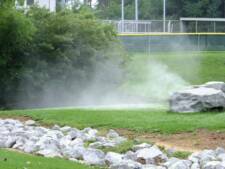 Get a "Rock Fan" with a professional misting system pump for very close to the price of a professionally installed misting system or a couple of commercial park benches. Save thousands on a expensive splash pad or swimming pool if you are specifying a new amenity for new or existing parks. We also custom build artificial rock covers, fountains, exhibits for museums, park benches, picnic tables, bubblers and retaining walls that look like natural bluffs. Hidden Outdoor Misting Fans for the Ultimate in Outdoor Cooling by "The Rock Fan"
The Rock Misting Fan outdoor cooling appliance can be installed or rented in resorts, swimming pool decks, city parks, water parks, jogging trials, golf courses, universities, zoos, botanical gardens, transportation waiting areas, outdoor shopping malls, garden centers, trail heads, outdoor dining areas, tennis courts, rest areas, museums, tourist attractions, civic centers and outdoor wedding venues.